DALLAS (FWAA) – Oklahoma State coach Mike Gundy has been named the winner of the 2011 Eddie Robinson Coach of the Year Award. The award, presented by the Fiesta Bowl, is selected by the members of the 1,200-member strong Football Writers Association of America. Gundy, a finalist for the award a year ago, is the first Oklahoma State coach to win the FWAA's coach of the year award and was selected in an association-wide vote from five finalists, including Michigan's Brady Hoke, LSU's Les Miles, Kansas State's Bill Snyder and Clemson's Dabo Swinney. Gundy is the third coach from the Big 12 Conference to win the award in the last 12 years. The official presentation of the Eddie Robinson bust to Gundy will be at a reception on Jan. 8, 2012, at 5:30 p.m. at Cochon in the New Orleans Warehouse District. ESPN's Mark May will host the event. Eddie Robinson Jr., officials from the Fiesta Bowl, the FWAA and the Eddie Robinson Museum will be in attendance. "What an honor to be recognized with the Eddie Robinson Coach of the Year Award," Gundy said. "We've had a tremendous year at Oklahoma State, winning the Big 12 and earning our first-ever trip to a BCS bowl. It's a testament to our players and our coaching staff that we are in the position that we are in. I want to thank the Football Writers Association of America for recognizing our team in this way." Gundy led the Cowboys to their first outright conference title since 1948, when the school was a member of the Missouri Valley Conference. The Cowboys (11-1) won their first 10 games before they suffered an upset loss in overtime at Iowa State. But they rebounded with a decisive 44-10 season-ending victory over arch-rival Oklahoma to win the undisputed Big 12 title and earn the school's first berth in a BCS bowl game. "Mike Gundy has earned this honor by inspiring excellence in his players. He led Oklahoma State to an 11-1 record in one of the nation's toughest conferences, and he did it with an entertaining style of play that captured the nation's attention," said Robert Shelton, the Fiesta Bowl Executive Director. "The Tostitos Fiesta Bowl is thrilled to match the Cowboys against the Stanford Cardinal in the highest-rated non-championship BCS bowl this year." The Cowboys are one of the most explosive teams in college football this year, ranking second in the country in points per game (49.3), second in the country in passing offense (386.2 yards) and third in the country in total offense (557.0 yards). "Coach Gundy is a very worthy winner of the Eddie Robinson Award this season," said Tommy Hicks, 2011 FWAA president. "The Cowboys were one of college football's most exciting offensive teams and came within an overtime loss of making the national title game. Oklahoma State has risen to national prominence under Coach Gundy." Gundy, 44, become Oklahoma State's head football coach in 2005, when he succeeded Les Miles. He has compiled a 58-30 overall record in seven seasons. The third-ranked Cowboys are in their sixth straight bowl game under Gundy – the longest postseason streak in school history. Gundy played quarterback at Oklahoma State from 1986-89 under coach Pat Jones and starred on teams that included Heisman Trophy winner Barry Sanders and standout running back Thurman Thomas. Gundy has been a part of four of Oklahoma State's five 10-victory seasons in its history as either a player or coach. "The Robinson Family is very pleased to honor another outstanding coach," said Eddie Robinson Jr., the late coach's son. "Over the years, the Eddie Robinson Coach of the Year Award has gone to the 'Who's Who' of the coaching profession. My father would be very proud to welcome coach Mike Gundy into that fraternity of coaches." The FWAA has honored a major-college coach with its Coach of the Year Award since 1957. In 1997, the FWAA coaching award was named after Eddie Robinson, the coaching legend at Grambling State University for 55 years. The late "Coach Rob" is the second winningest coach in Division I history (408 games). Robinson, who passed away on April 3, 2007, won 70.7 percent of his games during his illustrious career. Robinson's teams won or tied for 17 Southwestern Athletic Conference (SWAC) championships after joining the league in 1959. His Tigers claimed nine Black College Football Championships during his career spent all at the same school. Robinson was named by the FWAA in 1966 as "The Coach Who Made the Biggest Contribution to College Football in the Past 25 Years." He often took his show on the road to places such as the Louisiana Superdome, the Cotton Bowl, the Astrodome, Tiger Stadium and Yankee Stadium. And, with his star-studded array of players, Robinson helped integrate professional football. In 1975, with one of his greatest teams quarterbacked by eventual All-Pro Doug Williams, Robinson's Grambling team and Alcorn State became the first college teams to play a game in the Louisiana Superdome. The next season, Robinson's Tigers, along with Morgan State, became the first American college football teams to play in Japan. In 1949, Grambling standout Tank Younger was the first player from a Historically Black College to sign with an NFL team (Los Angeles Rams). By 1963, Buck Buchanan became the first player from a Historically Black College to be selected first overall in the professional draft (American Football League by the Kansas City Chiefs). Over the years, Robinson produced more than 200 players who wound up on professional rosters. A member of the College Football Hall of Fame, Robinson has the keys to cities all over the planet, has been awarded in every form and fashion and has honorary degrees from many schools. In 2010, the Eddie Robinson Museum was opened in his honor in Grambling, La., where numerous memorabilia now reside, including a bust of the Eddie Robinson Coach of the Year Award. The Fiesta Bowl is a non-profit organization founded by Arizona community leaders in 1971. Through the creation of the Festival of College Football, which is inclusive of more than 40 statewide events, the annual Tostitos Fiesta Bowl and the Insight Bowl, the organization continues to promote volunteerism, athletic achievement and higher education. Its mission is to remain a source of pride for all Arizonans by contributing strongly to the state's economic development, tourism and community causes. 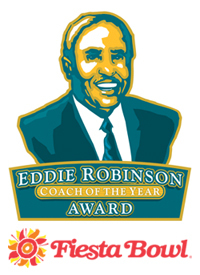 The Eddie Robinson Award is a member of the National College Football Awards Association (NCFAA). The NCFAA was founded in 1997 as a coalition of the major collegiate football awards to protect, preserve and enhance the integrity, influence and prestige of the game's predominant awards. The NCFAA encourages professionalism and the highest standards for the administration of its member awards and the selection of their candidates and recipients. For more information, visit the association's official Web site, ncfaa.org.